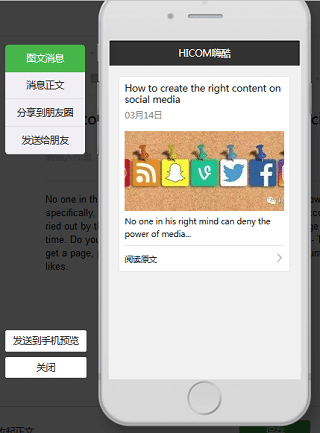 Wechat marketing has become a red hot topic. It is not just a new marketing trend, it is an absolute must for companies with any type of presence in China. But not really simple to use the back office to post english content on your official account. Wherever you go and whatever you do in China, WeChat is part of your life. It has reached a point that when meeting someone new, they will ask for your WeChat ID instead of your phone number. This means that virtually all of your potential clients will also be using this app, scrolling through their moments feed or even paying their gas bill with it, so your company’s presence on the platform is now vital. Therefore it’s now the perfect time to register your company account and create some buzz. 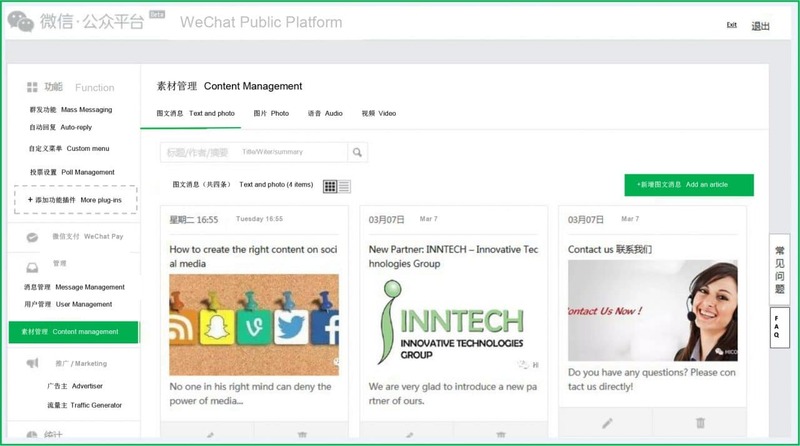 More and more non-Chinese companies are becoming aware of its potential and are diving head-first into the world of WeChat marketing. 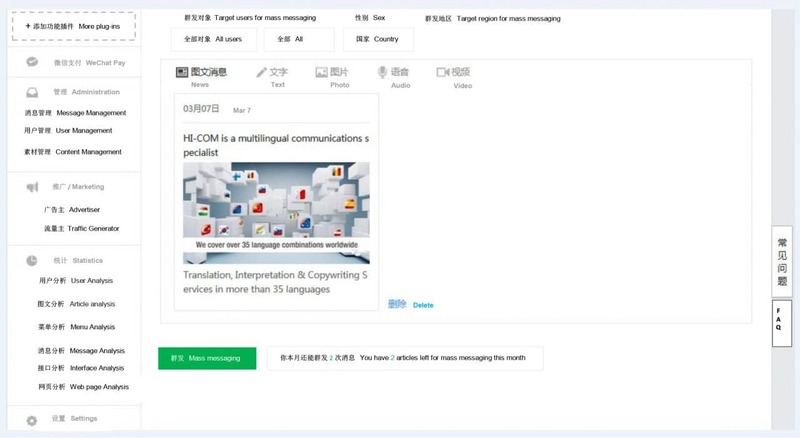 However, our friends at WeChat creators TENCENT haven’t yet provided us with an English version of the WeChat back office, which is making it a little tricky for non-Chinese speakers to use the platform. But have no fear, help is at hand! Our team here at HI-COM has translated the main pages of the back office and we will guide you through all the steps on how to post your articles. 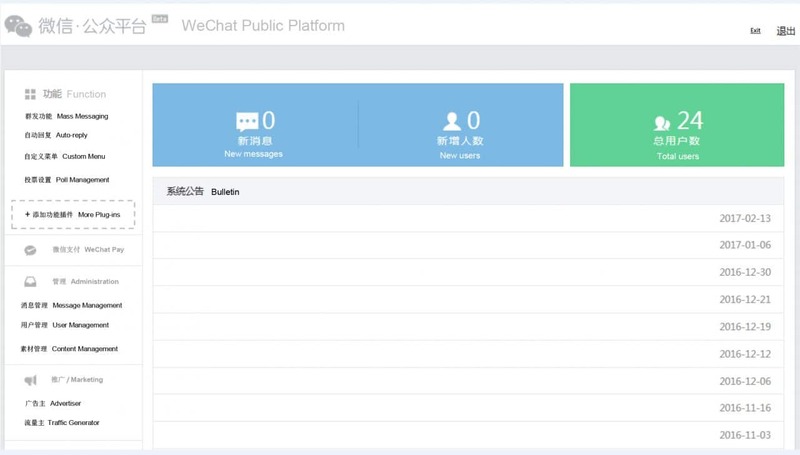 Firstly, check out the main page of the back office of a WeChat Service account below. A Service account will allow you to post 4 times a month. As you can see there are quite a few features. In this tutorial, we will only go through the steps for writing an article and publishing it. 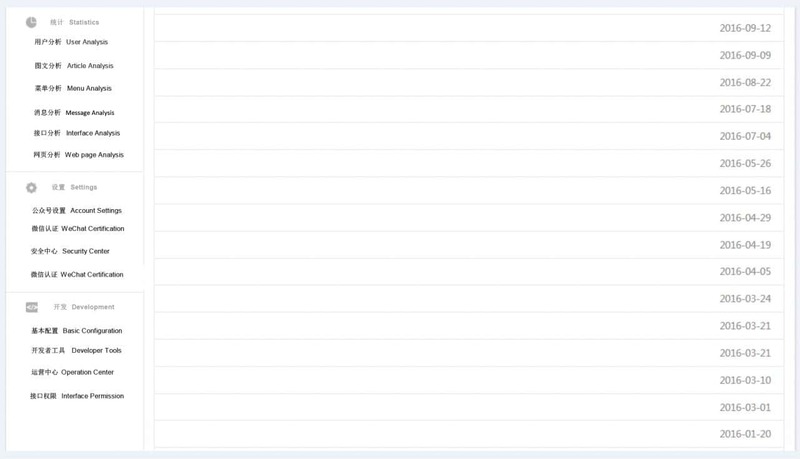 As you can see, we have a few articles already stored in this “library”. 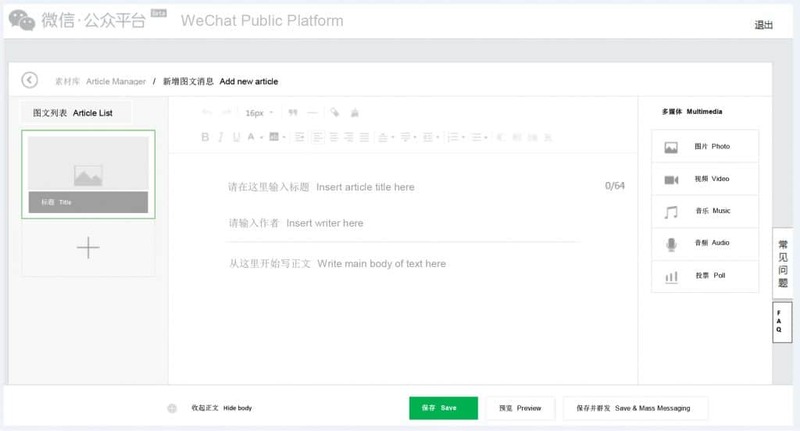 You can choose to publish text, photos, videos and even sound. In our example we will publish Text and photos. Here you can choose the type of media on which you wish to insert to your post. You can write your title (max.64 letters or characters), the author of the article and the post itself. Step 3: Write your article and save it by clicking on “save and Mass Messaging”. You can now select targeted users by gender and location (country). A quick final check and you are good to go with your post. Press that big green button. Now you have the English instructions, what are you waiting for?! Herlene Somook is a creative entrepreneur and freelance writer based in Manila, Philippines. A graduate of AB Psychology, she was a Kumon Reading teacher for five years before jumping ship to the Business Process Outsourcing Industry, where she gained experience in Inbound Sales, Technical Support, Outbound Services, Lead Generation and Marketing. Today, she spends her time as the Head Writer and Content Strategist for NextStep Hub. She loves reading bedtime stories to her toddler son. What Is Dropshipping And How Can It Generate Profit? 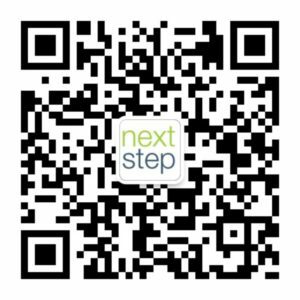 NextStep Hub is curating a wide variety of resources, tips, tools for entrepreneurs, start up and managers to help you succeed in Asia, China and across the globe. We want to help you take advantage of all the latest local and regional digital tools to help you amplify your message and brand in the region. Get more news from us! © 2019 NextStep. All Rights Reserved.